Sign up for random food opinions! 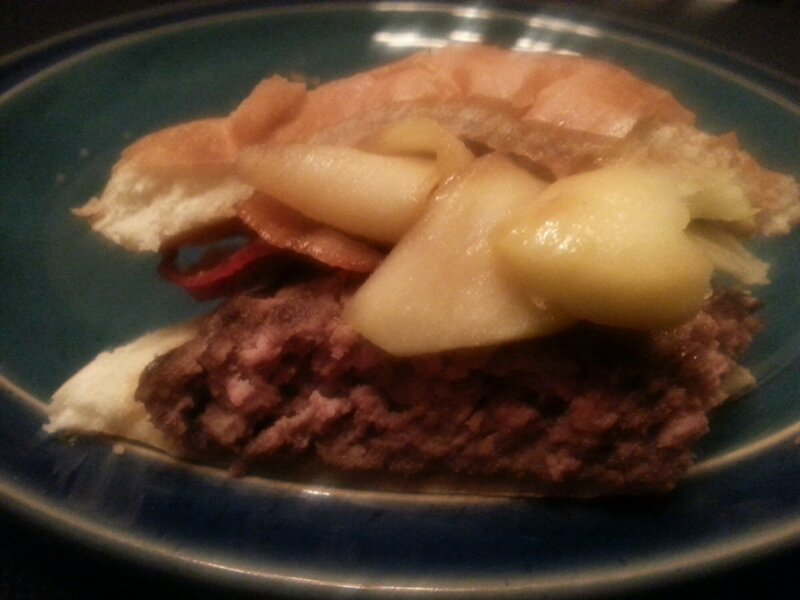 Inspired by the husband’s taste buds, supper tonight was a burger, seasoned only with salt. 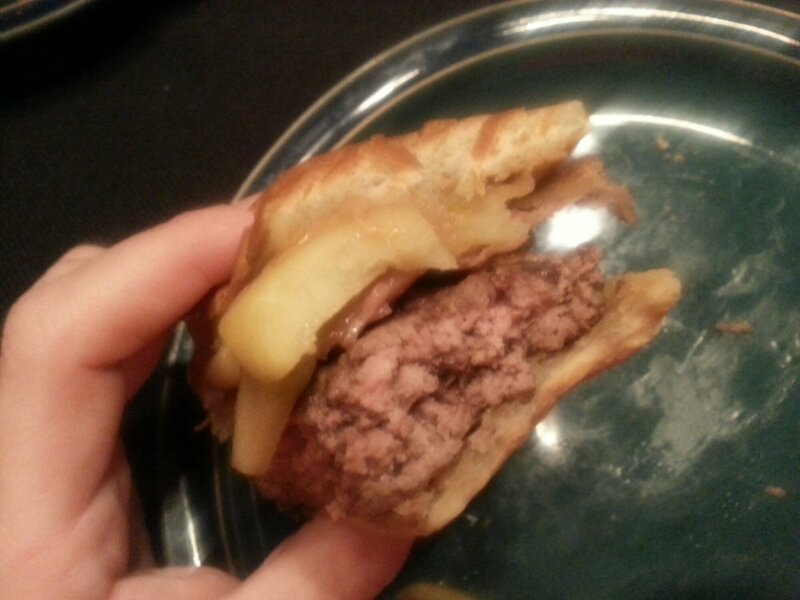 The burger was on a buttered bun slathered with smooth peanut butter. 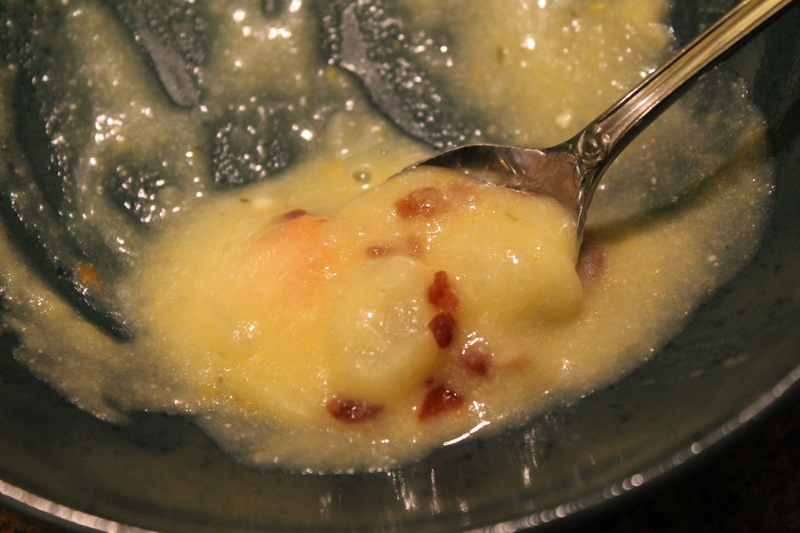 You also had a granny smith apple that had been sauteed in butter and brown sugar. Finally, bacon. It’s a keeper, my friends. Just fabulous. We’ve had a sick family member in Nashville, and we spent last Sunday mostly in a hospital waiting room. Not a fun way to spend a day, but we made it. That morning, we had had breakfast at McDonald’s and then lunch from a vending machine. It wasn’t too bad though. I had stocked up on quarters, and so we feasted on chips and chocolate. Plus, the kiddos thought the vending machines were the coolest thing evah. Before supper, we said our goodbyes and searched for real food. We drove around and round and ended up at a J. Alexanders that we weren’t really dressed for and probably didn’t smell right for either, but we went right in anyway. 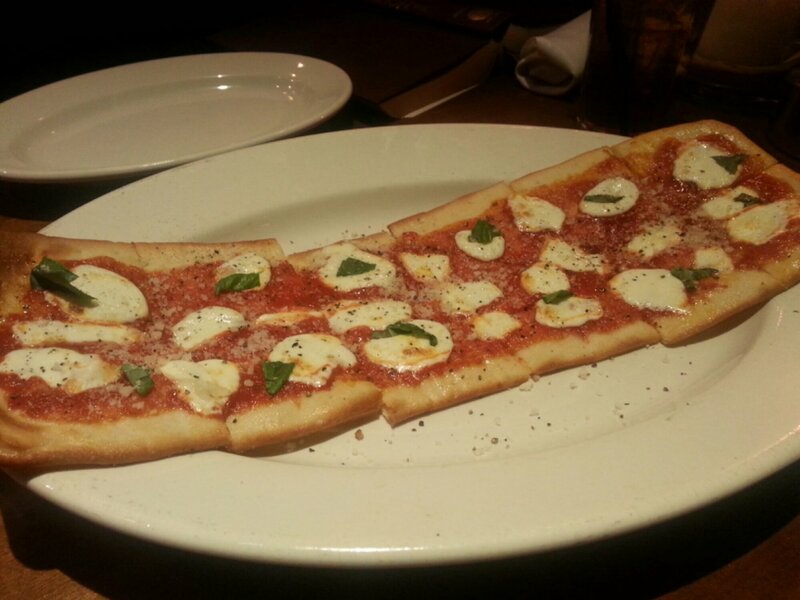 We started off with the Margherita flatbread thinking that Mr. Picky would like it. He did, but every one else really liked it. I do believe it is a recipe that I could make. I think I shall try. 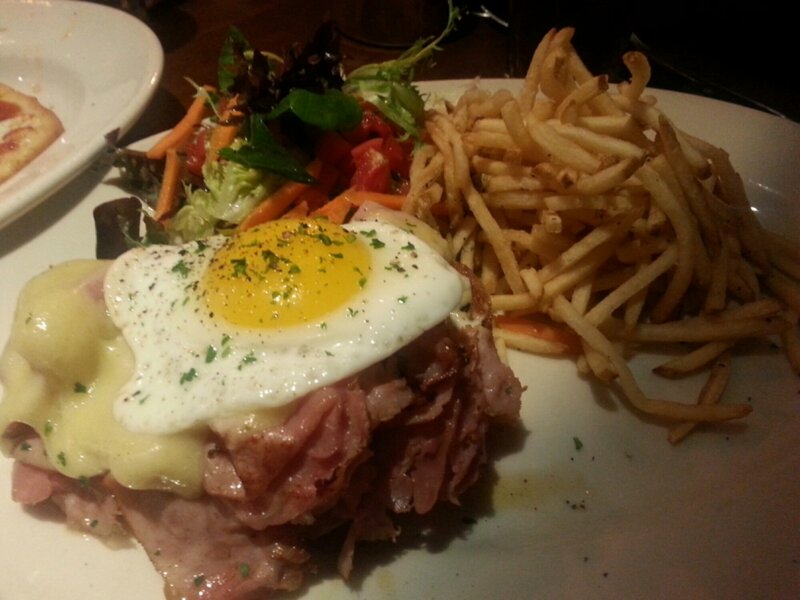 Miss Helper had the Croque Madame, a very big-girl sandwich for such a little person. I stole a bite (or two. or ten), and it was very good. I could try to make this one too. Maybe. Mr. Picky had the Not Your Ordinary Mac and Cheese and didn’t try a bite. When we got home, Miss Helper and I ate every bit of what he didn’t eat straight out of the doggie bag. Divine. I’ve already found the recipe. 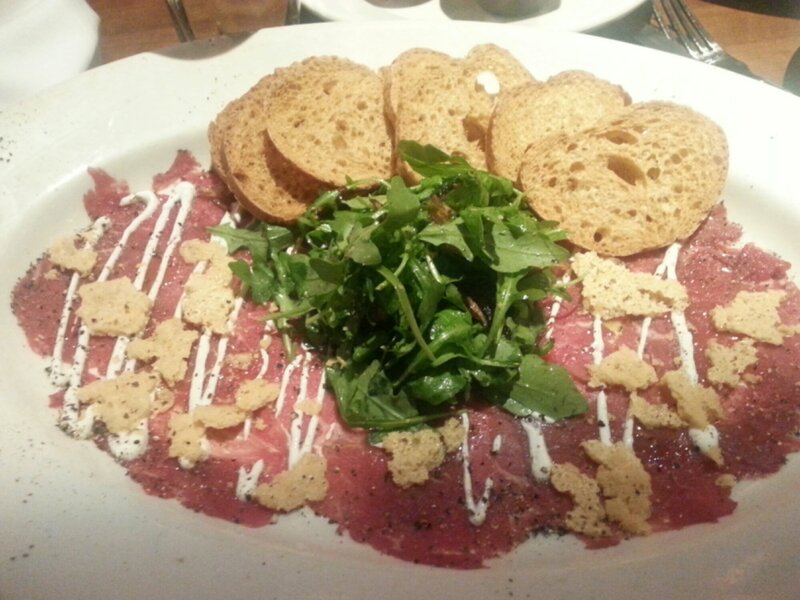 I had the beef tenderloin carpaccio in my ongoing attempt to eat the weirdest thing on any menu. I asked if it was a small plate because I thought the price was a little on the cheap side, and the waitress said that it indeed took up the whole plate which was indeed regular sized. Yes. I loved it. The sauce was a little absent from the dish, but the rest was neat to eat and tasty too. I did worry about the results of eating raw beef, but no worries. I am not going to try to make this one at home, though. Ever. Raw meat like that tenderloin is not going to be easy to find at our local country Kroger, I am sure. 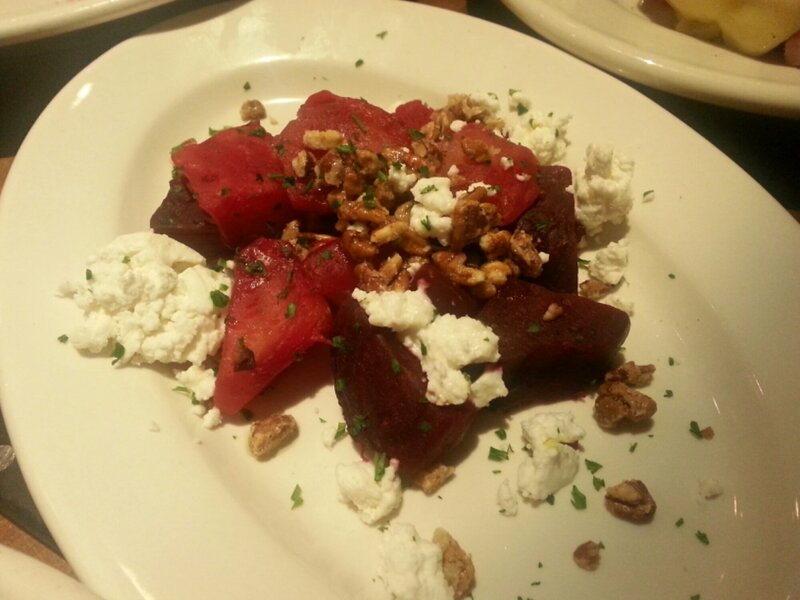 I also had the roasted beet salad. Now, that was good. It was warm and the goat cheese was creamy and not too goat-y. Delish. I think I could swing this recipe too-if I can figure out just how to get beets around here. I don’t want to go back to any hospitals anytime soon, but a trip to J. Alexander’s would be just fine. I ask you: Does the world need another potato recipe? Another potato casserole recipe? With bacon? And cheese? And the cliché can of cream of mushroom soup? I declare that the world does not. However, here’s one I am sharing with you that is so eloquently called Ranch Potatoes. It popped up on my newsfeed on Facebook last week when its recipe and convincing picture were liked or shared with at least four of my friends. Feeling the peer pressure that I had to try it since so many of my friends were trying it and I didn’t want to be the weird friend, I made it for supper. 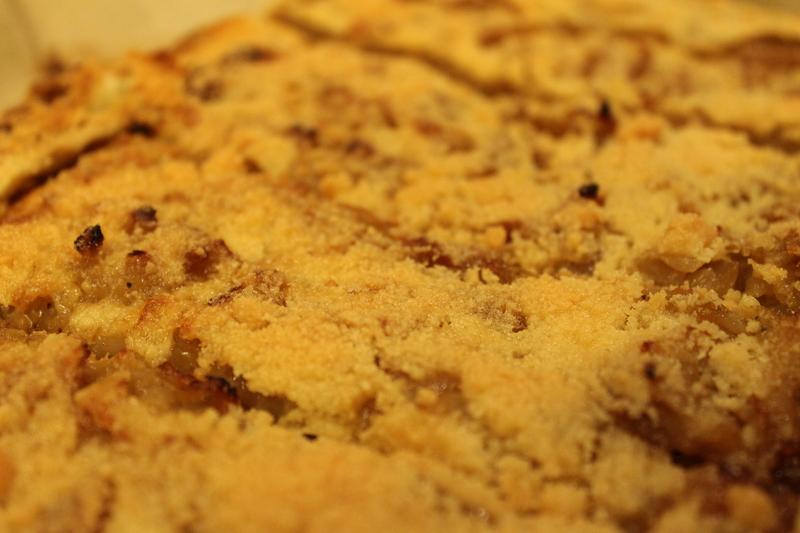 The recipe was easy enough to follow-this is Facebook, not Julia Child. I had all the ingredients on hand (and I think I usually do) so that was no problem either. Everyone at my table (who just so happened to be my closest of all my friends) liked it. I apparently was the only one who found a twang in several of my bites. I thought with those that my face was going to draw inside out. Whew. It was rough, but these potatoes were a hit with everyone else. So here it is, Foodie Friends. Yet another way to serve potatoes that may or may not make your face draw up. You’re welcome. One packet of real bacon bits-I didn’t use the whole package. 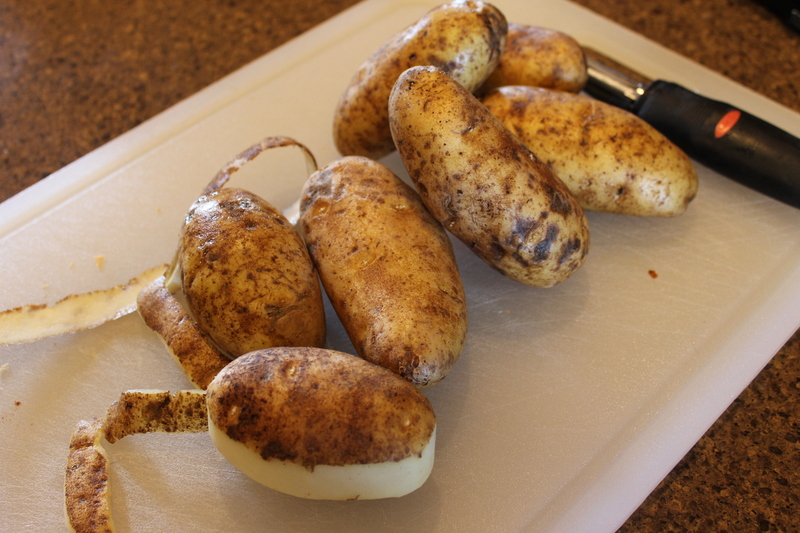 In a large pot, cover the potatoes with water and boil until they are just soft-about fifteen minutes. 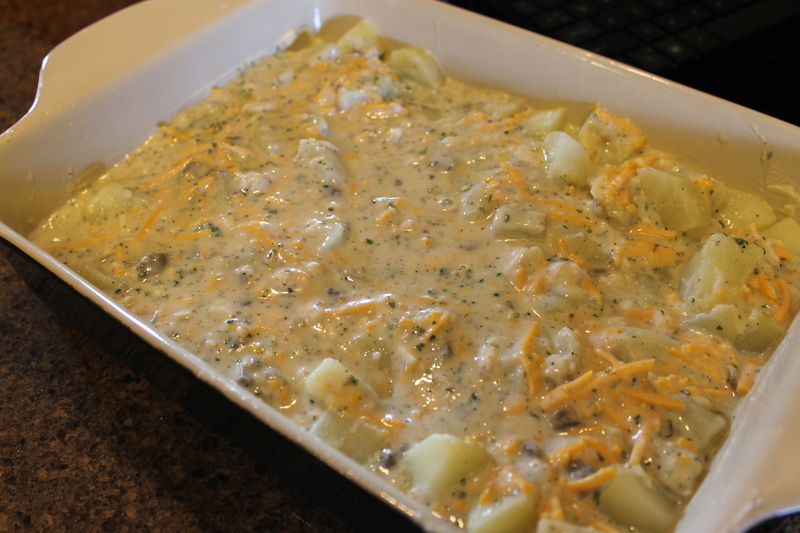 When they are done, butter or grease a large casserole dish and pour the potatoes in the dish. Mix the dressing mix, soup, milk, and one cup of the cheese together. Pour over the potatoes. 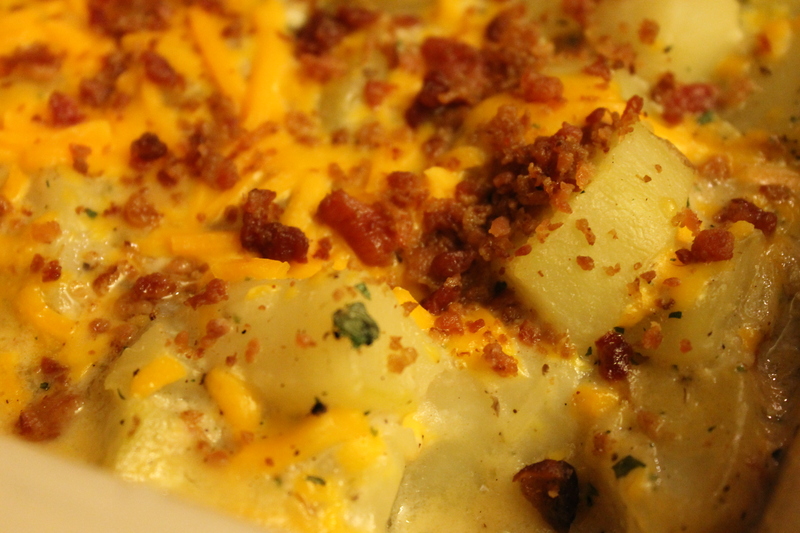 Top the casserole with the rest of the cheese and the bacon bits. For this month’s bookclub, I was so totally swamped with family and friends celebrations, cooking, caroling, decorating, helping abandoned animals from those sad commercials, and doing my Christmas service work, that I totally forgot to read the book! Of course, that is not true. I was just lazy all the way around, because there is no lazy like Christmas break lazy and Christmas break lazy don’t stop. Everyone who read the book which was basically everyobe except me, though, liked it fine. The book was The Winters in Bloom by Lisa Tucker. I loved her book Once Upon a Day, but I just didn’t get motivated enough to read this one. Actually, I wasn’t motivated to much at all like get dressed or brush my teeth on most days. I did cook one thing and prepare something else for bookclub, though. Go me! So, we had been to Sam’s and one of the many samples that I was abusing to fill Miss Helper up for free was multi-grain crackers with prosciutto on top. They weren’t too bad; she said that were good, so I had one myself. I bought the ingredients and remade them at bookclub. Simple. 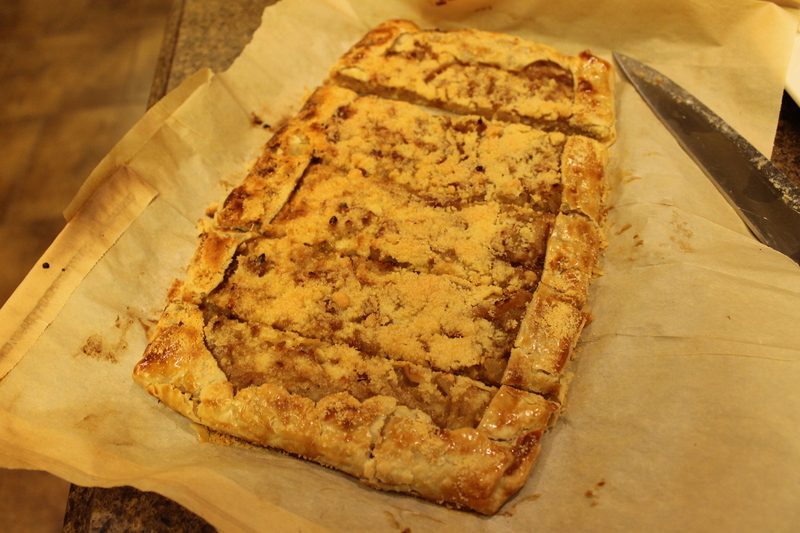 I also made an onion tart, or at least that is what I am calling it. I found the recipe in a magazine, but then I reworked it. I liked it a lot, but I do love onions. And cheese. And tarts. All the way around, it was good. We also ate some chicken salad stuffed in tiny little tomatoes, sausage balls, salmon on crackers with a dill sauce, and a reuben dip that was divine. It was a good bookclub, even if I have no clue what the book was about. 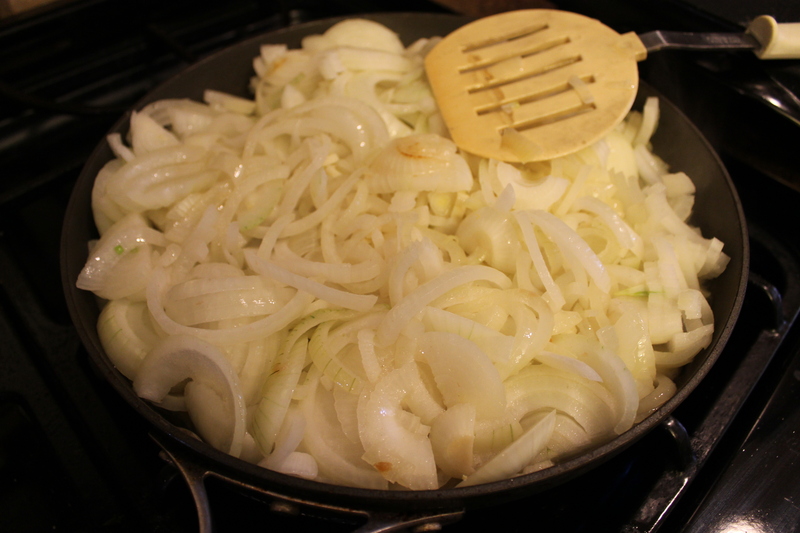 In a large skillet, melt the butter and then add the onions. Let them get a little tender, and then add the garlic. Cook the onions and garlic over low heat for a long time, about 45 minutes or until the onions turn golden brown. Meanwhile, line a large cookie sheet with parchment paper. Roll out the piecrust with a rolling pin and shape into a rectangle the size of the cookie sheet. Transfer the piecrust to the cookie sheet. When the onions and garlic are done, add half of the Parmesan and mix. Spread the onion mixture on the piecrust leaving a rim of piecrust around the edges. Fold those edges over and brush the edges with the egg. Bake for 15 minutes at 400. Then, sprinkle the remaining Parmesan on top and bake for 15 minutes more. Broil for 3 or 4 minutes if necessary to get the edges brown. This does not have to be hot to be good, but it was really good while it was hot. Ah, the annual Christmas progressive dinner. The dinner in which my two older sisters and I get to make food for our families and each other in an attempt to make a merrier Christmas while traveling around the countryside and trying not to overeat at the first stop. It is tougher than it sounds. This year, our progressive dinner was at one stop only and the theme was seafood. We transformed my living room into a dining room and the dining room into the living room so all eighteen of us could sit at one table. Other than rearranging most of my house, I was the appetizer, so my job was easy. The appetizer sister gets to sit back, serve small bites, and relax. Meanwhile, the other two sisters worry about something burning and/or not being cooked right at her house and the thought that everyone might eat too much at the first stop thus leaving a lot of food at her house with no one to eat it. Again, tougher than it sounds. 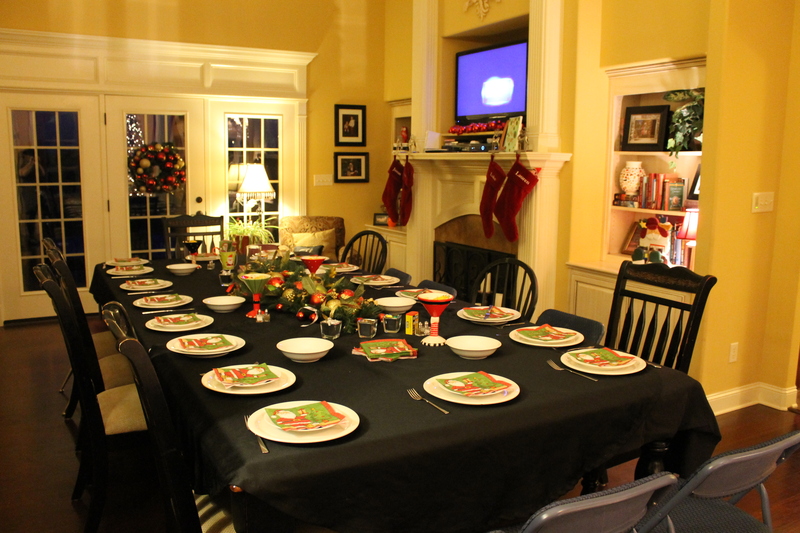 An issue for me was that we went out of town the day before the party for Christmas with my husband’s family, and I arrived home four hours before the party started. Yikes. Luckily, my food was easy enough to get a lot done ahead of time. 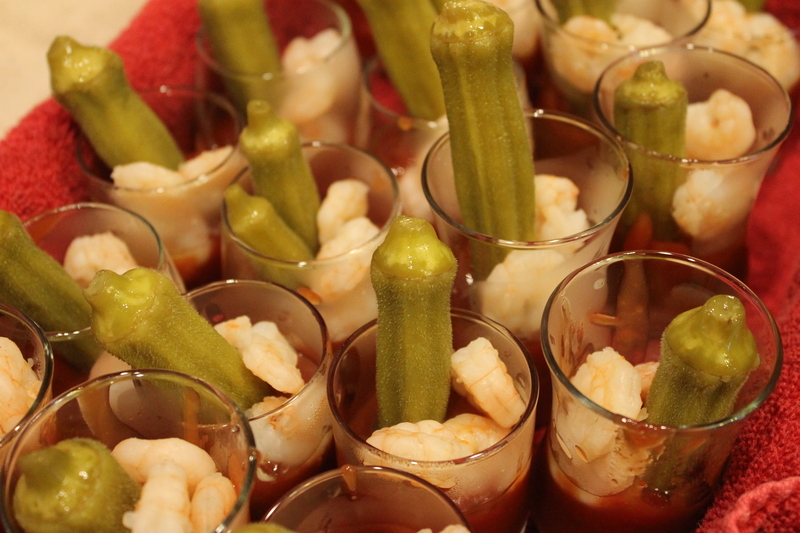 I served shrimp with a spicy homemade cocktail sauce and pickled okra. I liked it a lot, and it was pretty festive with the red and green in a little glass. It was also dang easy. The only thing I had to do was boil water for the shrimp, mix the sauce, and assemble the little boogers. 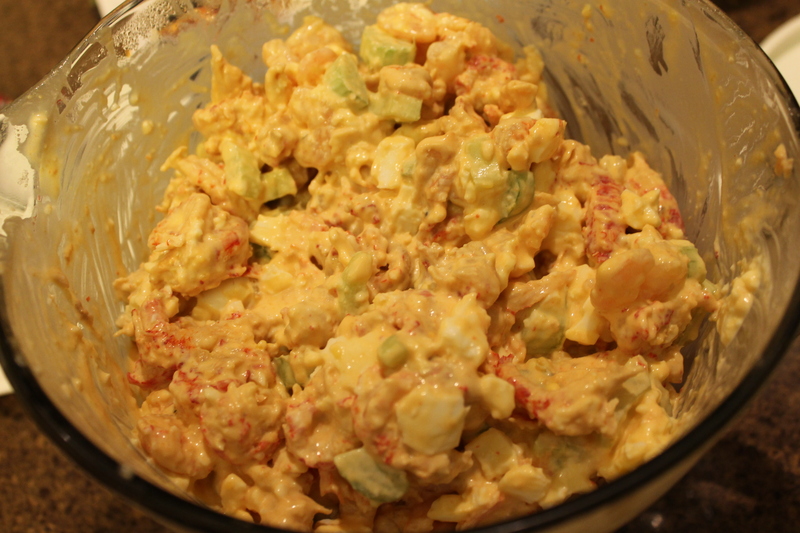 We also had Miss Kay Robertson’s shrimp salad from her Duck Commander cookbook. Since I was low on time, I made the decision to save all the shrimp I had for my other dishes and supplement the salad with two bags of frozen crawfish tails that I warmed up in butter before I added it to the salad as Miss Kay said to do. It was pretty good. It was creamy and crunchy. The last thing we passed around was The Pioneer Woman’s Skewers of Glory. Glorious might be a stretch, though. 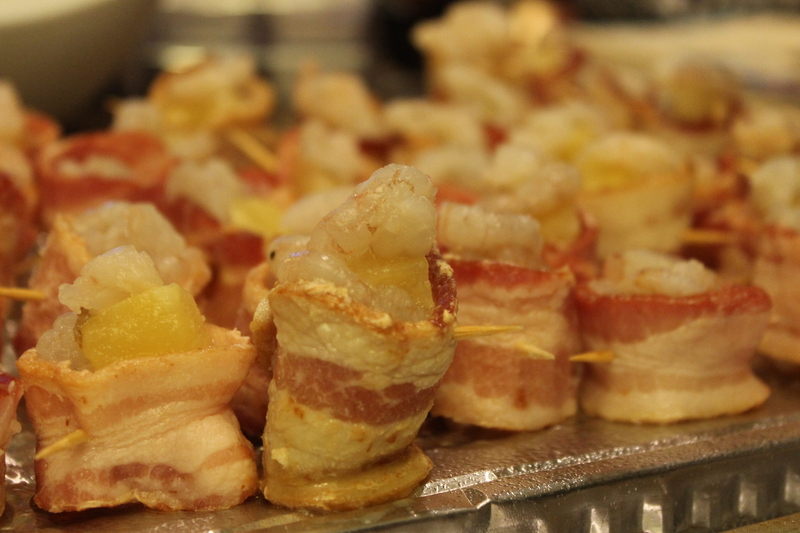 I precooked the bacon a little, used canned pineapple to make things easier, and I assembled the skewers when I got home. I was disappointed in the marinade, which was mostly at the bottom of the pan and not on the skewers, and the time it took to get the dish done. I cooked my skewers at least twenty minutes longer than PW said to and that’s even with the fact that I had precooked the bacon. Not fun when people are waiting for their first course. Still, it was another memorable miracle of a dinner. Our main course was salmon served with a dill sauce that I will think about for ages, roasted vegetables, and rice. Devine. Dessert was an angel food cake. Everyone ate too much, and we laughed too hard. Combine all and chill. 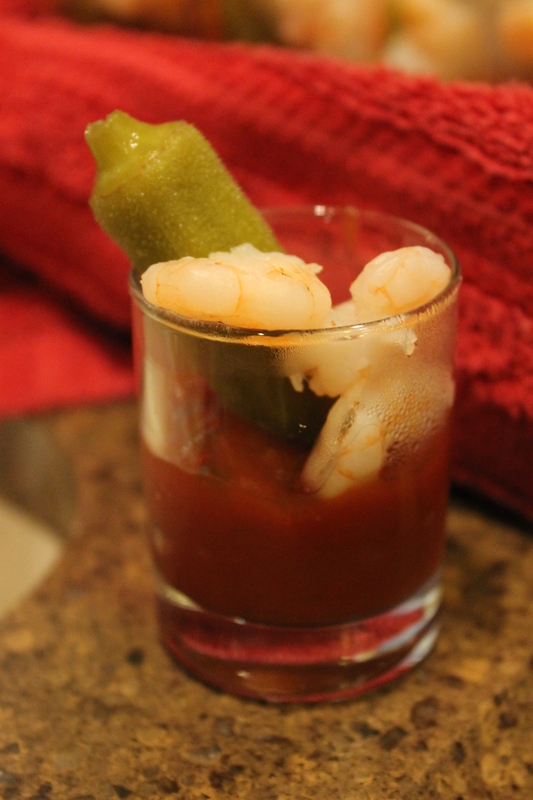 In a small glass (I used tasting cups), layer the cocktail sauce, then the okra, then fill to the top with small shrimp. This has been the best weekend ever. The last time I was outside of my house was Thursday at 3:45. It is now Sunday afternoon. So, so lovely. We have worn almost the same clothes since arriving home from school. I have just about finished two books, watched hours of Say Yes to the Dress, played games, watched Christmas movies, and cooked. It has all been lots of fun. Our first snow-weekend meal was fondue. We were in Nashville for Thanksgiving, and we stopped by Trader Joe’s on our way out of town to mingle with the yuppies and grab some unique eats. I tried to hang like a yuppie, but all my clothes matched and I left my sunglasses in the car so I couldn’t wear them in the store. So embarrassing. I got some kale, seaweed, and a bag of almonds as big as my head for my brother-in-law; I am sure it is a gift that will keep on giving. (Shout out there to Mark and Cousin Eddie!) 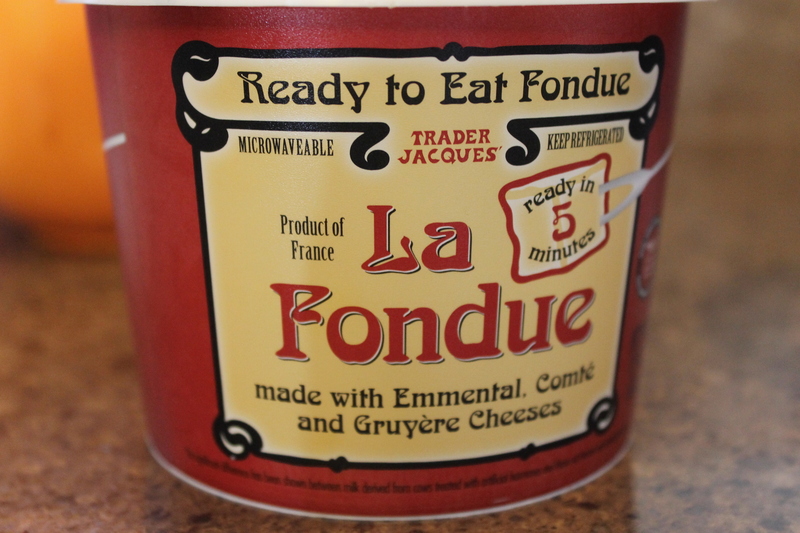 I also got all sorts of weird cheeses, so peppermint pretzels that I didn’t share, and this tub of fondue which we ate with leftover Conecuh sausage and some crunchy bread. Delish! After we ate, I made the usual joke about how we were now fondone. Mr. Picky just rolled his eyes at me. For dessert, we had the necessary snow cake. It was the reason for the snow, I am sure. It just melts like snow in your mouth and lasts the whole snow weekend. I also made a potato soup that was a recipe of a friend’s friend. To. Die. For. I didn’t have Velveeta, so I used four cups of shredded Cheddar instead, and it was still fabulous. We ate it twice, and then I threw the rest out so I could use my large pot for chili. That did not go over very well when Mr. Opinionated went looking for it. I thought I was going to be thrown out in the snow. Yikes. I was spared when I promised to make it again someday. Whew. The chili was okay, but it was beanless. Beanless chili is unheard of around here, but apparently I am expected to have beans even when the road looks like a mirror because it has so much ice on it. 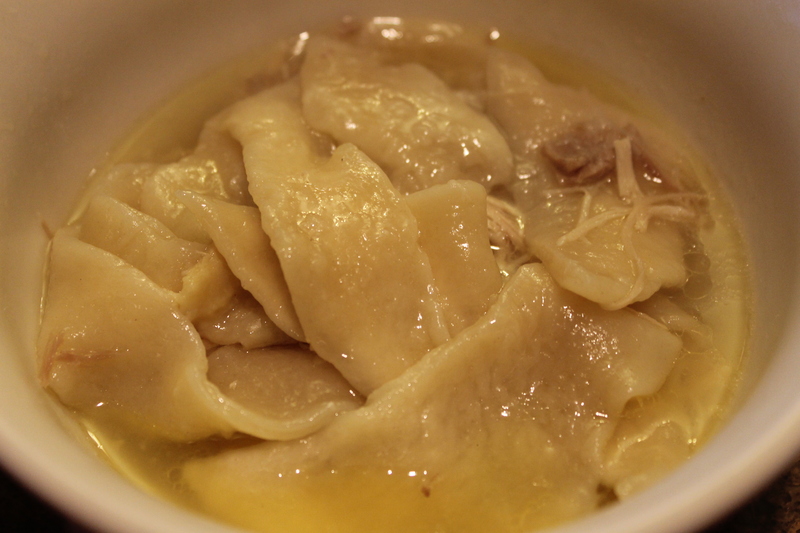 Today I made Grandma’s chicken and dumplins. This is the food that should be made for anyone who has to get out in weather like this. I promise you that a bowl could put hair on your chest and keep you warm for a month. It made up for the beanless chili. Next, I am going to try to make buckeyes. Depending on if we have school tomorrow or not, who knows what else is coming out of my kitchen. One thing’s for sure, it better have beans in it if it is supposed to. In a large pot, combine all of the first eleven ingredients. Cook until the potatoes are tender-about fifteen minutes. Combine the flour and milk. Add flour and milk to the soup and bring to a boil. Stir often. 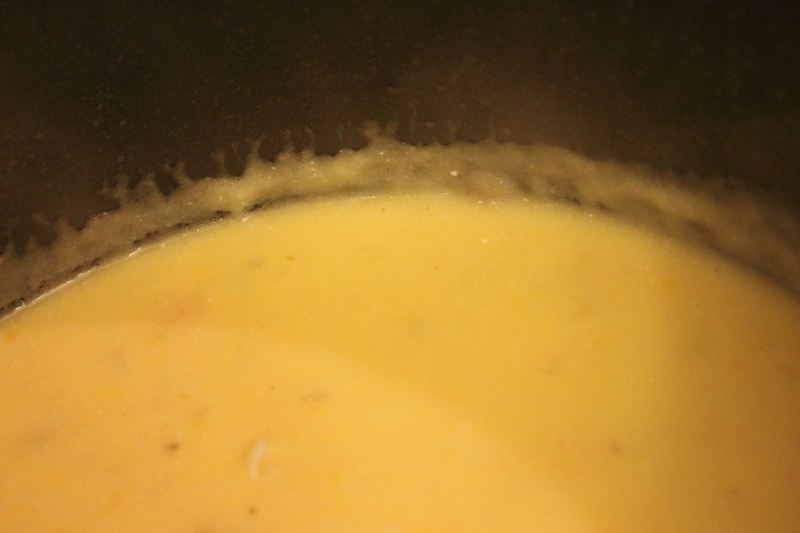 Remove the pot from the heat, add the Velveeta, and allow to sit with the lid on for several minutes for the cheese to melt. Add the sour cream and stir to incorporate the cheese and sour cream. The ride home from vacation is never fun. This year, the trip from Destin was a quiet one. We were tired, full of memories, and road-weary. The movies were going in the backseat, and sand was still in our shoes. We had had enough fun for a while. Still, I had to have just one more foodie stop on the way home. 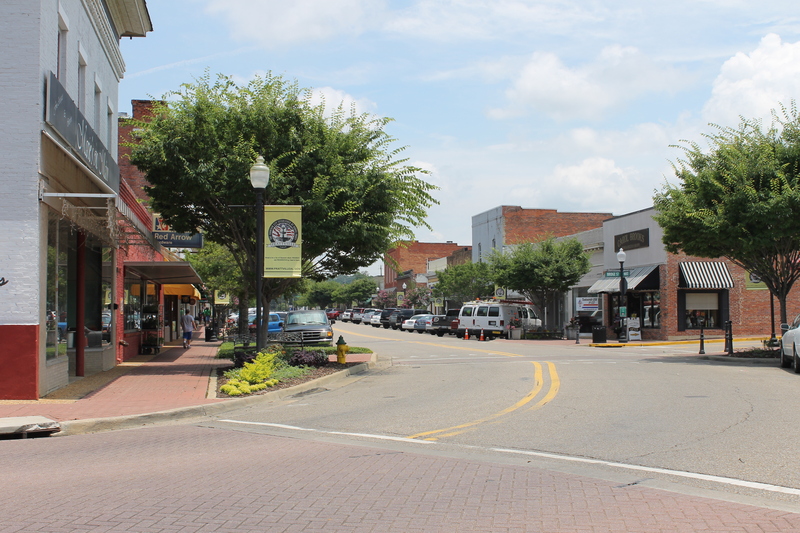 I did a little searching on my phone for a lunch stop as the miles rolled by, and Uncle Mick’s in Prattville, Alabama was a name I kept seeing. 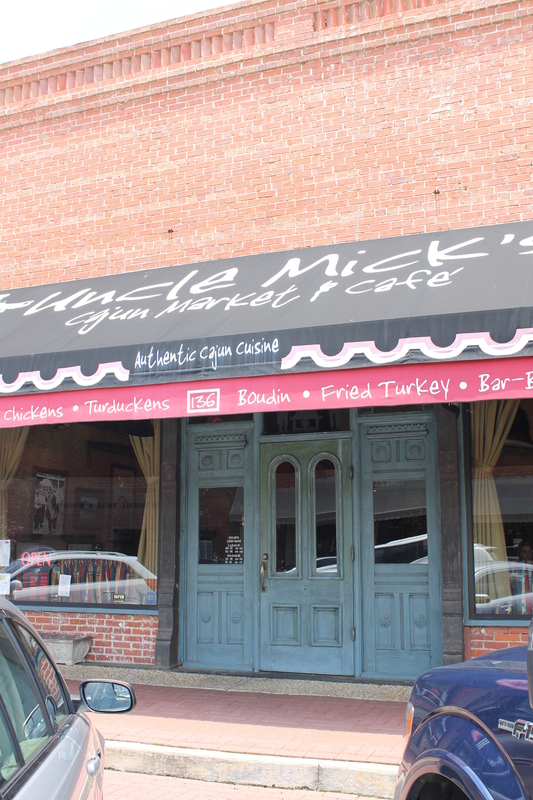 Maybe it was that Uncle Mick’s sounded like a good place, or maybe it was the fact that they didn’t care where lunch came from, or maybe it was that they didn’t want to hear me whine about missing it, I don’t know. But regardless, the fam went along with the idea of stopping there for one last culinary adventure before home. We took an exit and drove and drove and drove. There was a lot of huffing at this part of the journey as Mr. Opinionated was not too happy to be driving past the chain restuarants by the interstate to try a place we’d never heard of. He survivied, and we made it to Uncle Mick’s just before a meltdown. We walked in, and the place was very nice. The food is served cafeteria style, and so we just walked right up to the start of the line. 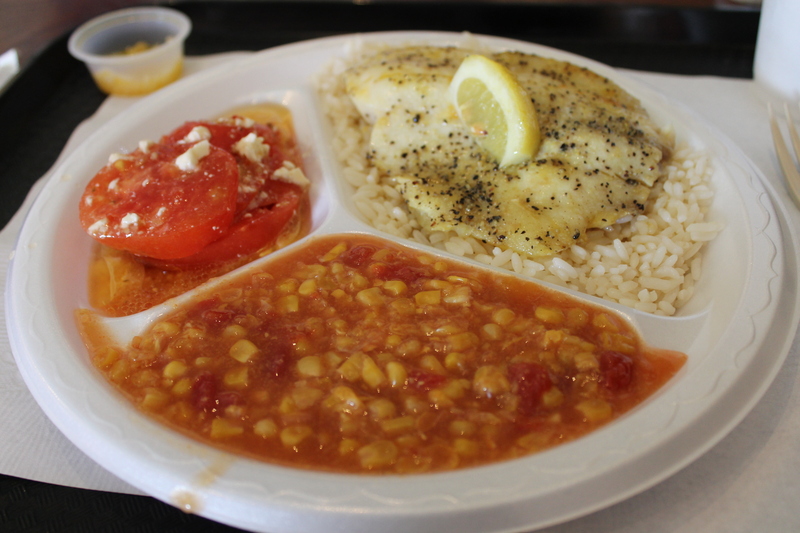 I had the tilapia with the Corn Maque Choux and tomato salad w/Feta cheese. Even though we had just eaten fish for a week, the tilapia was still good. The corn was awesome. 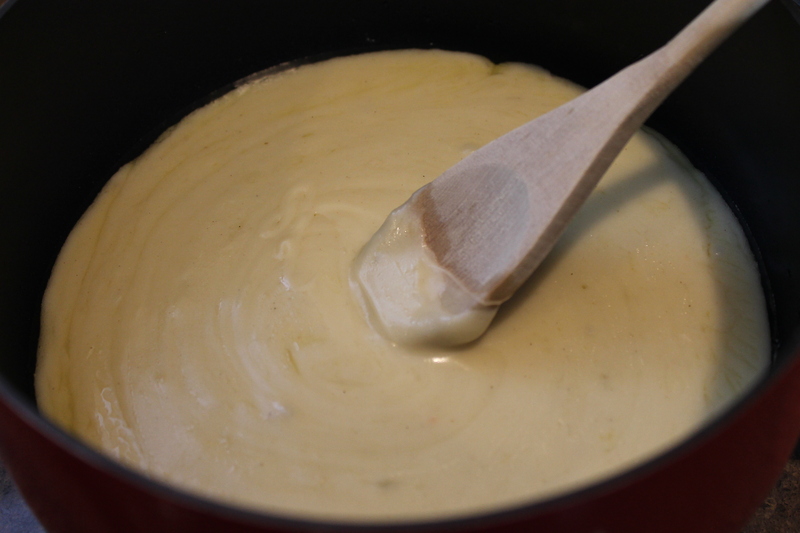 I had never heard of maque choux before, and it was a dish to try. Yum. 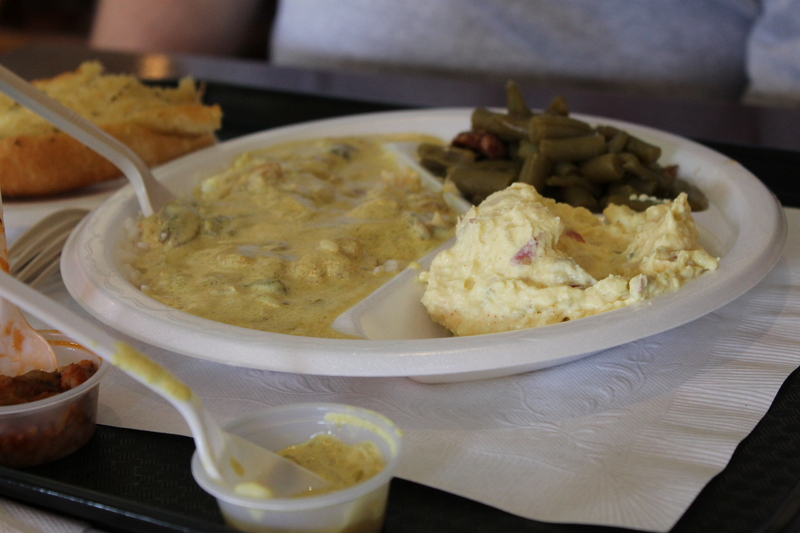 After all his huffing, Mr. Opinionated had the crawfish etouffee, and he liked it fine. He may have loved it, but he wouldn’t have let me know that. 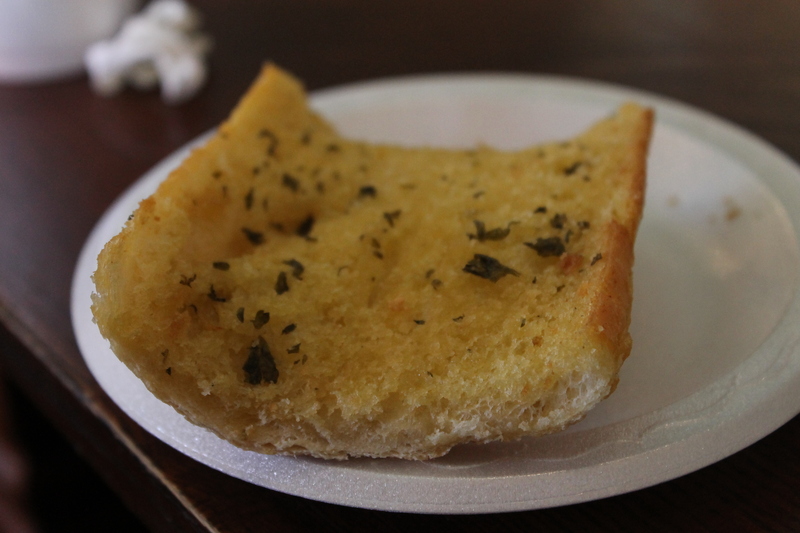 Mr. Picky enjoyed the garlic bread. Go figure. For dessert before the rest of the long road ahead, we had the bread pudding. 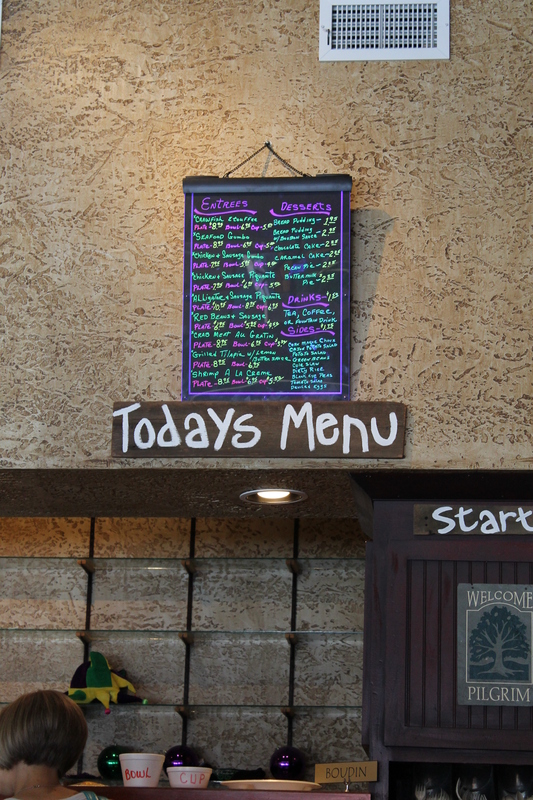 When we ordered it, they set it aside and warmed it up when we were ready for it. 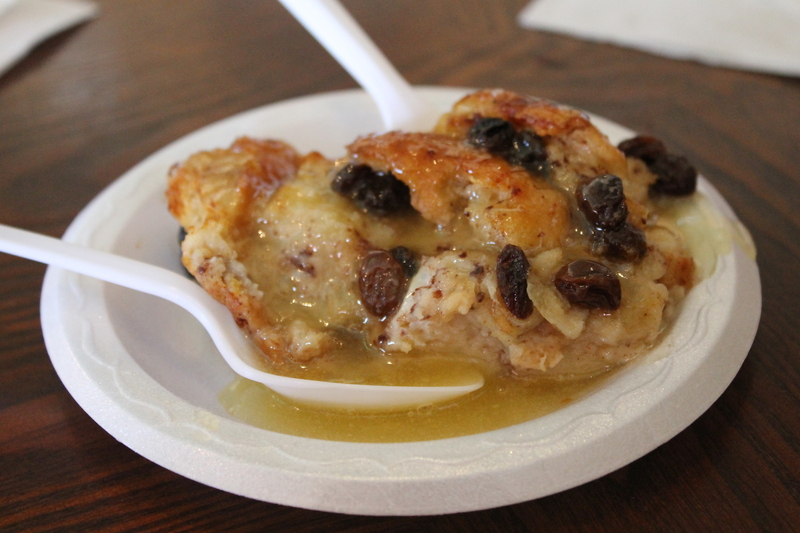 It would have been better had we not just had the best bread pudding on earth at Harbor Docks. This ride home was another long one, but Uncle Mick’s is a place to put in the GPS for good. The food and atmosphere were a nice break from the interstate-even if it took us a little while and a lot of huffing to get there.